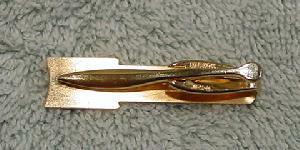 This vintage gold-tone tie clip is by Hickok and was made in the USA. 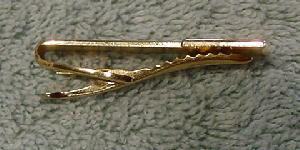 It has horizontal ridges in the center (with some tarnishing on the left side) and a freeform rectangle on the right. 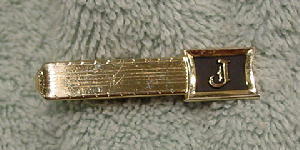 The rectangle is framed and has a black inset with a gold-tone letter J in the center. There is a light surface scratch on the bar. It belonged to a former male model who now uses his real first name (which doesn't begin with a J).